Burgermeester – the master of burgers or the mayor, depending on how you read it in Dutch – is a great place for satisfying that burger craving at lunch time! 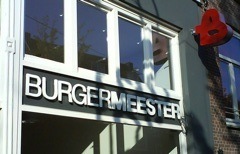 There are two Burgermeester restaurants now, one in De Pijp and one in the Jordaan. Both provide an interesting variety of richly garnished burgers in a modern minimalist diner-like setting. The set-up of Burgermeester is no frills. You sit in booths around plastic tables that seat four to eight. The walls are painted white and bright red. 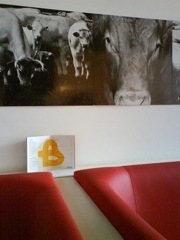 And there is no further decoration except for a band of pictures of cows that goes around the entire room. You order your burgers directly at the counter and pay up front. The kitchen is open and you can watch your burgers being made. Service is friendly and kept to a minimum. Burgermeester is all about great burgers. There is an extensive menu with a great variety beef, lamb, turkey but also lentil, goat cheese and salmon burgers. There are a few extras such as corn on the cob and baked potato, but otherwise it’s all burgers. The burgers are served either in regular size or as a popular “mini”, of which you can then also order a trio to sample three of the ingenious burger compositions. The burgers are prepared masterfully – the meat is top quality and plenty, ingredients are fresh and all burgers have very distinct and flavorful spices and sauces. Last week I tried the burger of the month, which was a “Tokyo burger”, a Japanese beefburger with bok choy, wasabi mayonnaise and a surprising and super yummy ginger flavor! Too bad I only found out on the 30th of the month… The current burger of the month is cod and olive. I think the fresh and quickly served burgers as well as the friendly no frills setting make Burgermeester an ideal lunch venue! 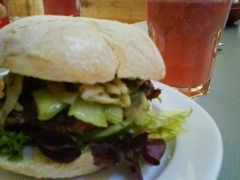 You can find Burgermeester de Pijp on Albert Cuypstraat 48 and Burgermeester Jordaan on Elandsgracht 130.